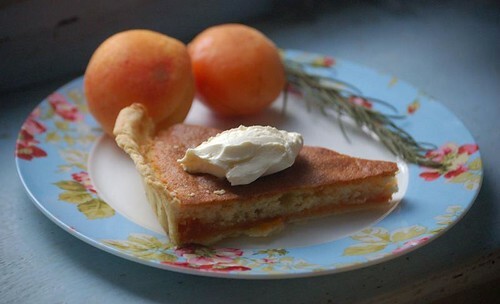 I never cease to be inspired by apricots, one of my favourite fruits for cooking with. This tart has many of the same ingredients as apricot frangipane tart, but with quite different results — and it’s much quicker to make. It’s based on the very English Bakewell tart, but the usual raspberry or strawberry jam is replaced with an apricot compote flavoured with vanilla and rosemary. I venture to suggest that the result is better than the original; apricot and almond are a classic pairing, and the sharp, intense flavour of the apricot layer contrasts well with the light, spongy topping. You can serve this lukewarm as a pudding, with a dollop of crème fraîche, a pool of custard, or simply some pouring cream. Or when cold, serve as a cake with tea. The recipe makes much more compote than you need, but this is no hardship; store it in the fridge and serve folded through Greek yoghurt, with ice cream and crisp almond biscuits, as a layer in an apricot trifle, or as a cheesecake topping. I recommend tying the rosemary up in muslin if you don’t want to spend ages picking spiky leaves out of the finished compote with tweezers. No need to ask how I know this. Wash the apricots, halve them, and remove the stones. Put the oil and butter in a heavy saute pan. Slit the vanilla pod lengthways, and scrape the seeds into the pan with the tip of a knife. Heat the oil and butter, then cook the apricots over a high heat for a couple of minutes, turning them to start the juices running. Add the vanilla pod, rosemary, muscat, and sugar. Continue to cook on a low heat, stirring occasionally to stop them sticking. The apricots will cook to a mush, and the juice should reduce and thicken; this will take about 20 minutes. Taste to see if you like the result; if you have a sweeter tooth than I do, you might want to add more sugar. Remove the vanilla and rosemary and leave to cool. Pastry: make some plain shortcrust with 120 g of flour and 60 g of butter, and use it to line a 20-cm tart tin. Cream the butter and sugar until smooth and light. Beat the egg with the almond or vanilla essence, then beat into the butter mixture a little at a time. In a separate bowl, whisk together the dry ingredients (except for the flaked almonds) and add to the egg mixture in two batches, beating thoroughly to incorporate. If the mixture seems stiff, add a little milk. Preheat the oven to 180C. Spread the pastry in the tin generously with the cooled compote. Then carefully drop dollops of the topping on top, using a wet knife to spread it to cover the entire surface. It will look meagre, but it puffs up as it cooks. If there’s any pastry left over, you can cut out leaves or other shapes to decorate the top. Or sprinkle with a few flaked almonds. Bake the tart for about 30 minutes, until the top is brown and springy. Leave to cool to lukewarm before serving. What an elegant and stunning tart. That apricot topping over cheesecake idea sounds so amazing too. Thanks for the inspiration. I’ll be baking big-time for a cake stall that I shall be organising at the end of July. Every year my regular bakewell tart has homemade raspberry jam, spread thickly, on the base, and the portions seem to fly off the plate. Now I have seen this one of yours – I am very tempted to try this one too – though not sure if my young apricot tree will provide any fruit this year! This really is lovely. I think you could make the apricot compote with dried apricots if necessary — you’d need to soak them to plump them up first, and maybe use more liquid.